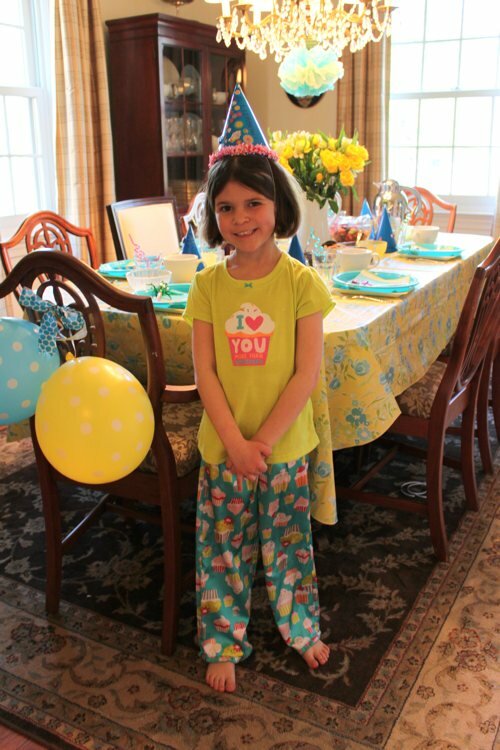 Last weekend we celebrated Elizabeth's 6th birthday with a Pancakes & Pajamas Party. 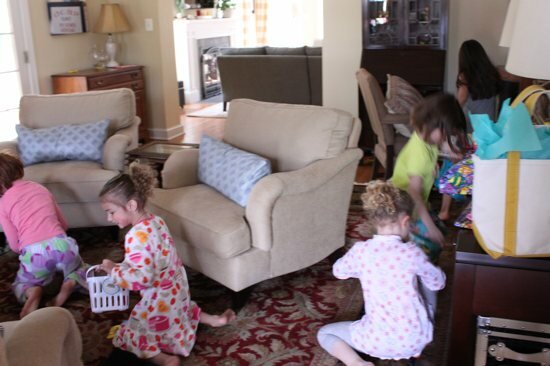 Six of Elizabeth's best friends came over at 9 a.m. on Sunday morning wearing their PJs ready for pancakes!! They were all so cute and super excited to show off their PJs! 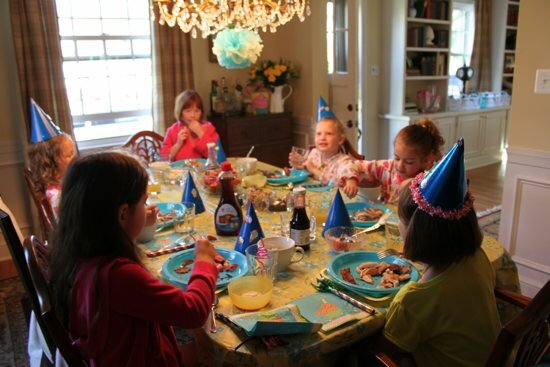 This was a great compromise for a 6 year old birthday since most of the kids are not ready for sleep-overs but they are already excited about the possibility! 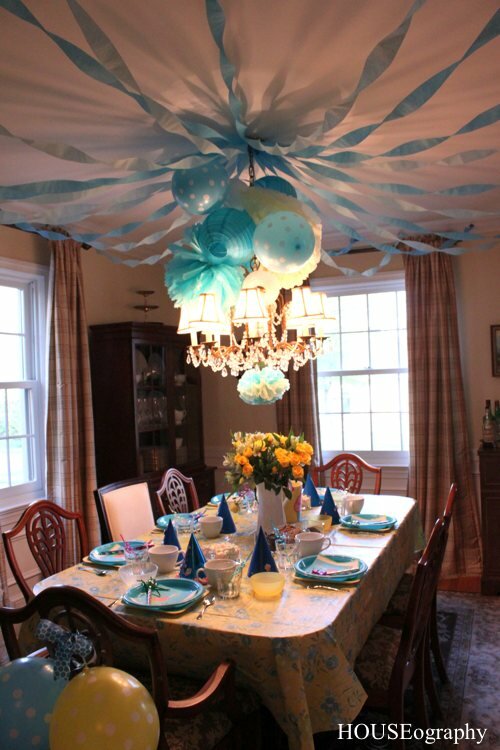 I spent a good part of Saturday morning hanging a ton of streamers in the dining room. I wanted it to feel enchanted. 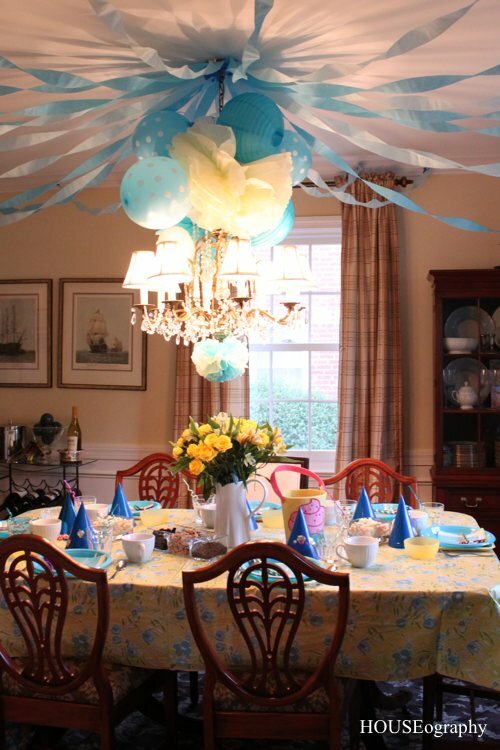 Thankfully the blue painters tape held overnight and only 2 streamers had fallen by morning! 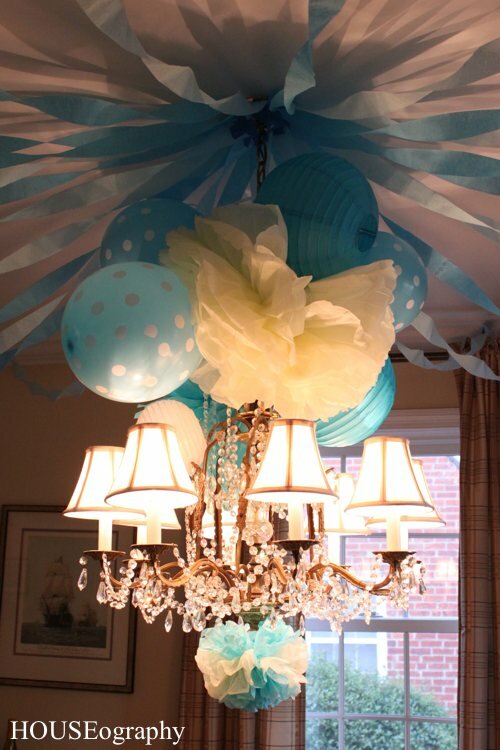 I added balloons, paper lanterns, and tissue paper poofs around the chandelier. That's my little man Alex working on his own cereal necklace! 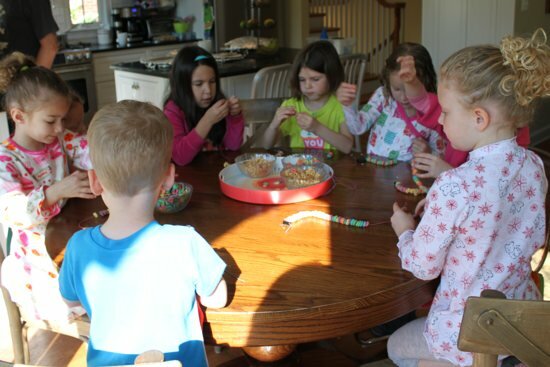 After tying 8 square knots on the necklaces, we moved them into the dining room for pancakes and hot chocolate. We had special toppings for the hot chocolate including graham cracker and oreo pieces and mini chocolate chips. And of course whip cream in a can! For the pancakes we had maple, strawberry, and blueberry syrups, as well as fresh fruit. I also had yogurt for them in a bowl on the side. 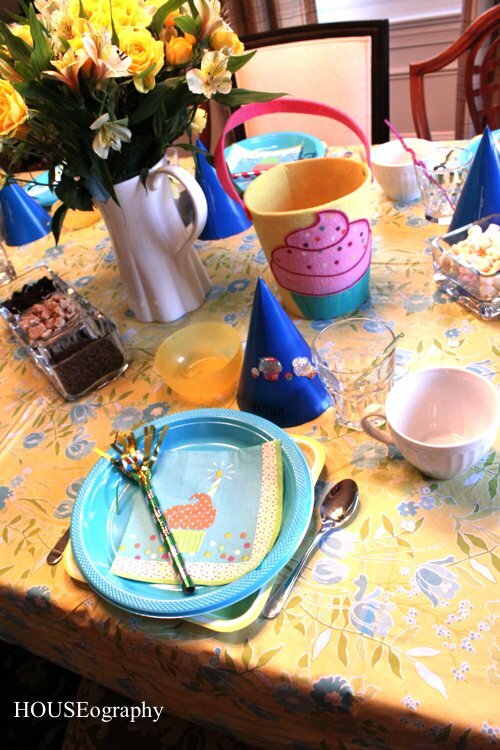 I think they felt very adult sitting in the dining room with coffee mugs! 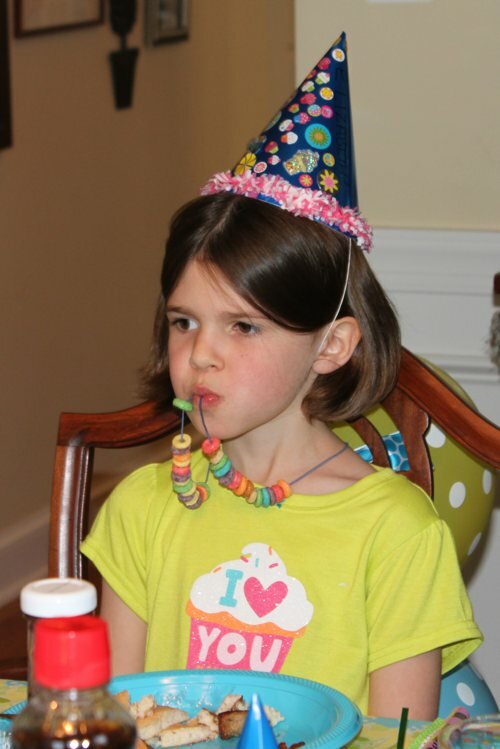 Of course, curly straws and a cereal necklace snack ensured they were firmly in kid-ville! After pancakes, they headed outside (it was almost 80 degrees at 10 a.m.!) 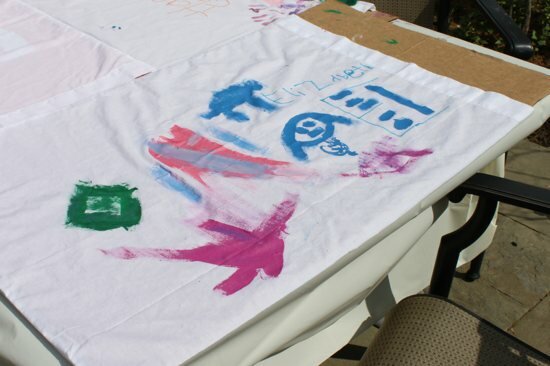 so they could decorate a pillowcase. 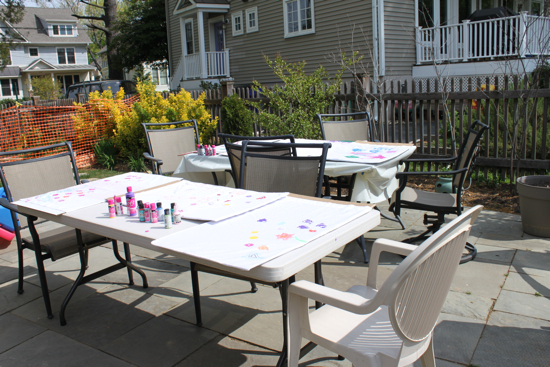 I bought the pillowcases in bulk on ebay and I already had the fabric paint from baby shower onesie decorating (more on that here)! 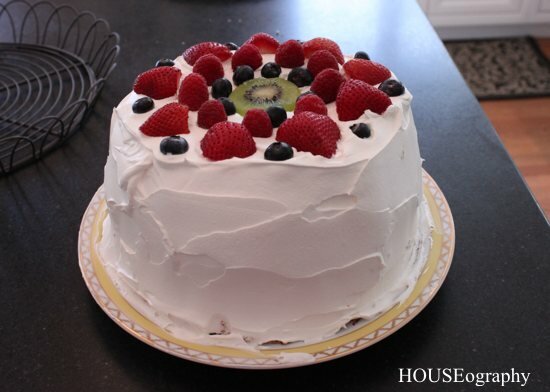 Finally, they came back in for my no-bake homemade cake (recipe to follow tomorrow). 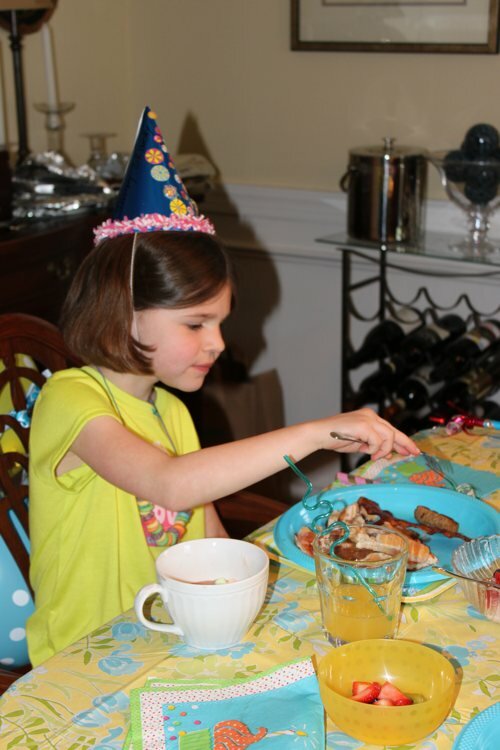 By this point the girls were super sugared up but with only a few minutes to go, Elizabeth opened her presents. Total chaos but so much fun for the girls to see her open their hard-thought presents! 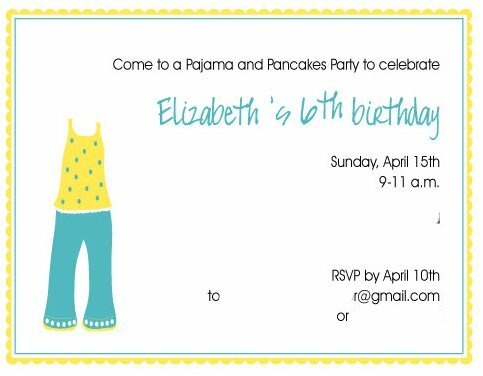 The adorable invitations and favor labels were made by Michelle at Bugaboo Designs. 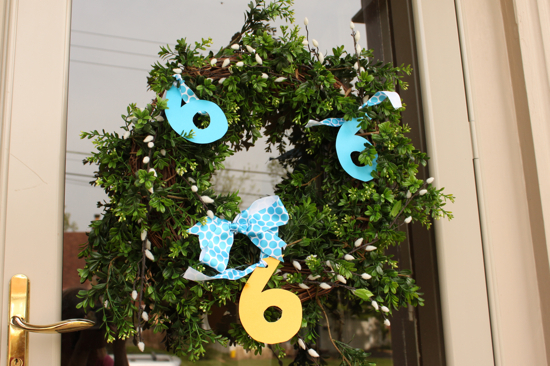 I also customized my winter wreath to greet Elizabeth's guests with some more ribbon and some "6"s cut out of card stock I had on hand. 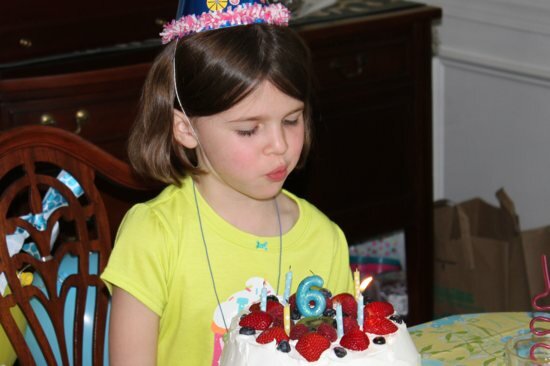 Hard to believe my baby girl is 6 years old! p.s. I found a lot of inspiration on Pinterest, and especially from the very talented Cassie at Hi Sugarplum! Thanks Cassie for so many awesome ideas! !